Triumph is releasing the top 3 levels, with 28 New Residences. 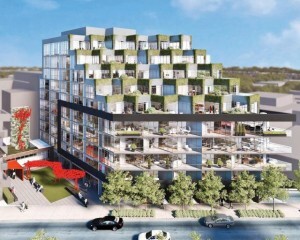 Howard Park Residences will be in Roncesvalles Village at 24 Howard Park Avenue, by developer Triumph Developments and The Walsh Group, and the architecture is by RAW Design. There’s two phases, the first phase is a 10 storey (96 suites) east tower, to be followed by an 8 storey (104 suites) west building. This collection of properties will be along Howard Park Avenue, between Roncesvalles Avenue and Dundas Street West. They will create an eclectic site for a new mixed use building with retail at the ground floor. Howard Park takes advantage of the slope of the site to create efficient and easily accessible parking area and a striking entry court bordered on one side by a glazed bridge linking the two buildings. Terraces cut into the slope of the building will enjoy a view of the city as the landscape drops away. Howard Park will have a range of units from street related townhomes to smaller suites and large penthouses with expansive terraces. This special event is scheduled for this month! >>Click here to contact me if you are interested in attending this event, or if you are interested in any other Toronto condo or loft development.